I"ll post what I have later today or tomorrow. The price of the plans will be $ 1,445.00 and $ 1,735.00. The 36 can be fitted with a flying bridge. Foam sandwich is my preferred method. You can build the long panels flat on the shop floor and assemble them the stitch and glue way. - put them on the jig and finish the outside fiberglass: tape seams, extra layers etc. - flip the hull, fiberglass the inside. but to prefab the panels flat on the floor eliminates the need for an elaborate slat mold. It's just like plywood-epoxy but you end up with a true composite hull. Thanks - what about the Jazz 30 - I don't see any study plans on the website or is that not quite ready? If the weather is good the next few days we may get up to Vero Beach before our haul out in Indiantown on April 20th. If you live in Florida you are welcome to see our Skoota and talk boats. the SK32/36 are now available on Bateau.com as a pre-order, along with study plans, which will be updated as we receive more information. 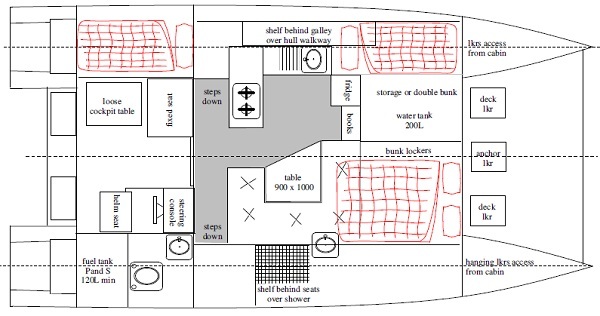 I recall some mention that the hulls were narrower as they did not need room for accommodations? Also what is the Bridgedeck clearance from the waterline? Maybe it would be best to email me direct at woodsdesigns@gmail.com to say what exactly you want to use a Jazz30 for, as the cockpit and deck layouts can vary according to peoples needs. The Jazz 30 is none of those, it has been designed as a fishing boat, water taxi, workboat. Basically not a cruising boat and probably only used for day trips. The use determines which deck layout and central cuddy you have. Thanks Richard - I sent you an email. Thank you for your email which I will answer shortly, but maybe tomorrow as it's late here now in the UK. I was out all day yesterday test sailing a dipping lug sailed schooner and today I was checking up on progress with the Skoota 32 currently being built. Tomorrow I sail a Transit 38 sailing catamaran on its maiden sail. See my richard.woods.designs Facebook page for more. I checked on the Blue Planet 32. Its not a very good design, you can never convert a sailing hull to a powerboat, nor vice versa of course.